1. +1 on Owen’s Trail through Sherrill. Some mornings it’s open by 6am, some it’s not. 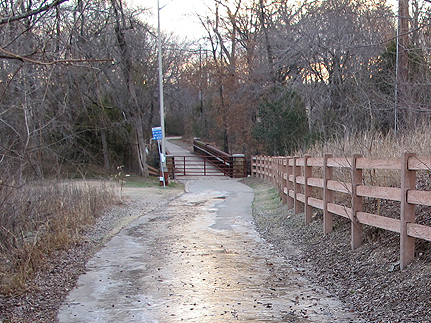 Yesterday Feb 10th at 3:35PM I cycled through Sherrill’s main gate toward Owen’s Trail. A golf cart came up the path at high speed toward me and then turned into the office area. I got to the gate to find that the guy on the cart had just locked it. I waited figuring he’d turn around and come unlock it for me. Nope. I had to turn around, exit again through the main gate, and cycle the roads with busy afternoon traffic. +1 on the traffic light sensors – they should all work, but start with those on the city bike routes, like Collins at Jupiter and Plano. I know it is “legal” to run the red after waiting through two cycles, but the motorists just see another cyclist running a red light so you feel compelled to push the pedestrian button (kinda defeats the purpose of biking). Both of the Bicycle Friendly designations provide a pretty good structure for helping cities see how they can improve and there aren’t many in Texas so far.